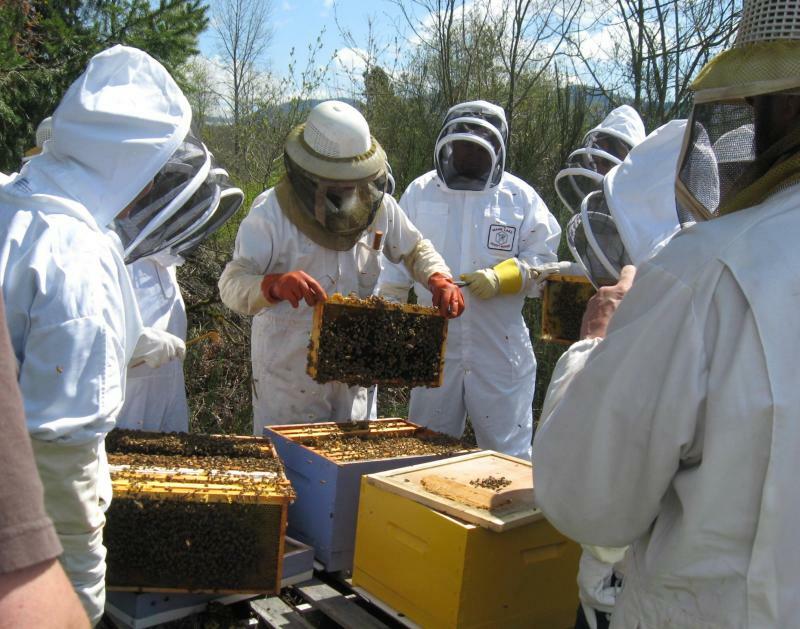 LCBA's 1st 2018 workshop was May 26, 2018, about conducting hive inspections on packages & nucs installed this spring. Over 30 beekeepers and 6 mentors worked the bees & enjoyed a Q&A over refreshments at our new club apiary. We also held workshops on supers removal, Varroa testing, Fall Management practices, and making candy boards. Saturday, May 20, 11 a.m. to 1 p.m.
LCBA workshops are free & open to the public; donations to support our educational programs are appreciated! 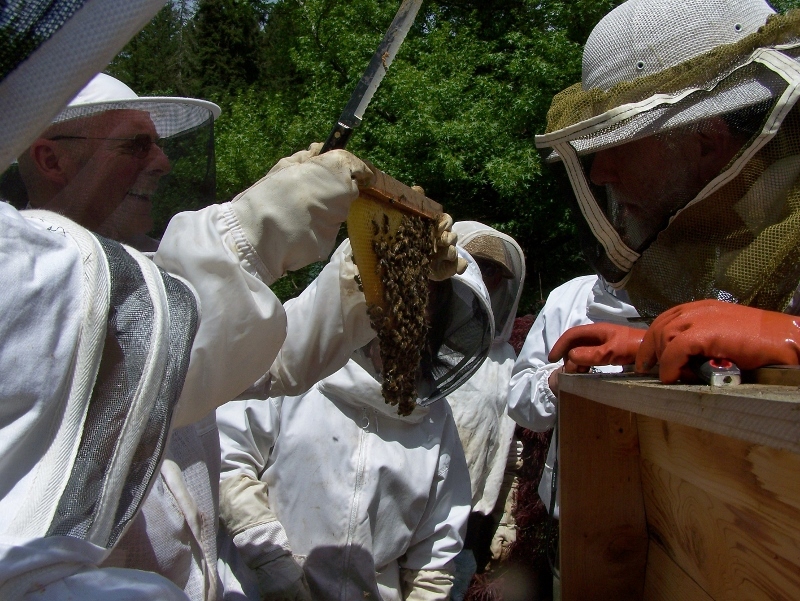 Above, first year beekeeper Dave assesses a frame with guidance from mentor Cody as their group looks on. At our Sept 12 Fall Management workshop, about 30 beekeepers assessed colonies' food supplies, varroa mite loads, & worked on preparing bees to over-winter. See links above for fall management & over-wintering info. * The "bang & brush" method. For an illustrated discussion, click here to see the slideshow & descriptions in our Photo Gallery. * hived 2 impromptu swarms . . .
* went through colonies to assess brood patterns . . .
* added boxes & supers where appropriate . . .
* watched baby bees hatch out . . .
* identified swarm & supersedure cells . . .
Our April 18 Spring Hive Inspection & March 21 Hive Assembling workshops on March 21 were lots of fun! 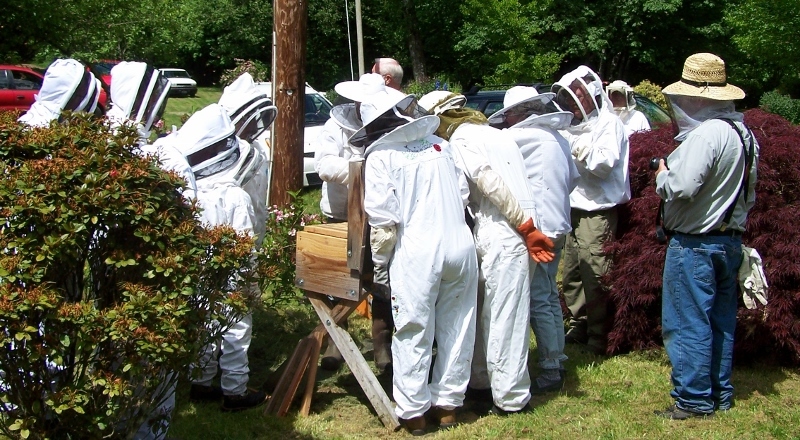 On April 18, about 30 new beekeepers worked with 8 mentors & all got hands-on in hives. 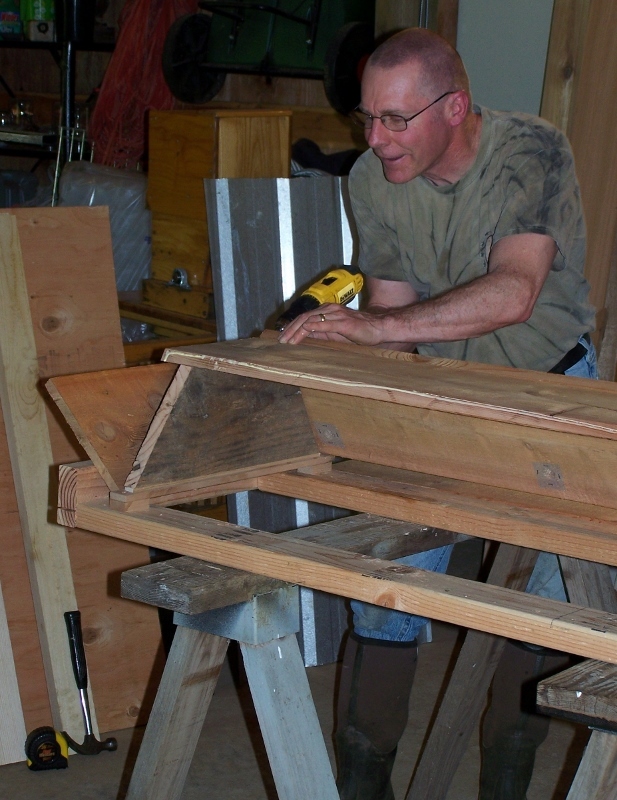 On March 21, 18 new beekeepers put hive parts together with help from 8 mentors. To see photos, visit our Photo Gallery. Below, some pictures from our earlier 2014 & 2013 mentor-led workshops; for more, please visit our Photo Gallery pages. 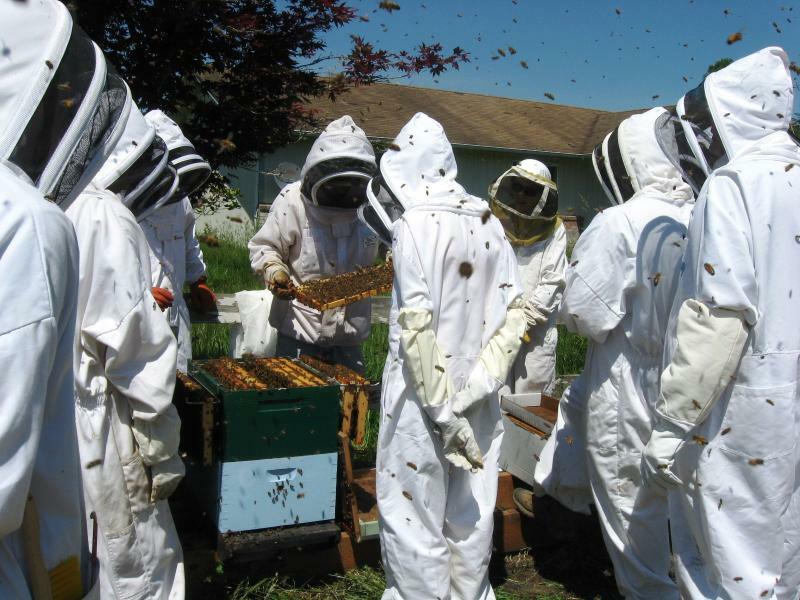 Our mentor program supplements ﻿our ﻿﻿beginning beekeeping classes﻿﻿﻿ (see below) and our ﻿monthly meetings﻿. Since our mentors are volunteers, resources only allow ongoing one-on-one mentorship for LCBA members. 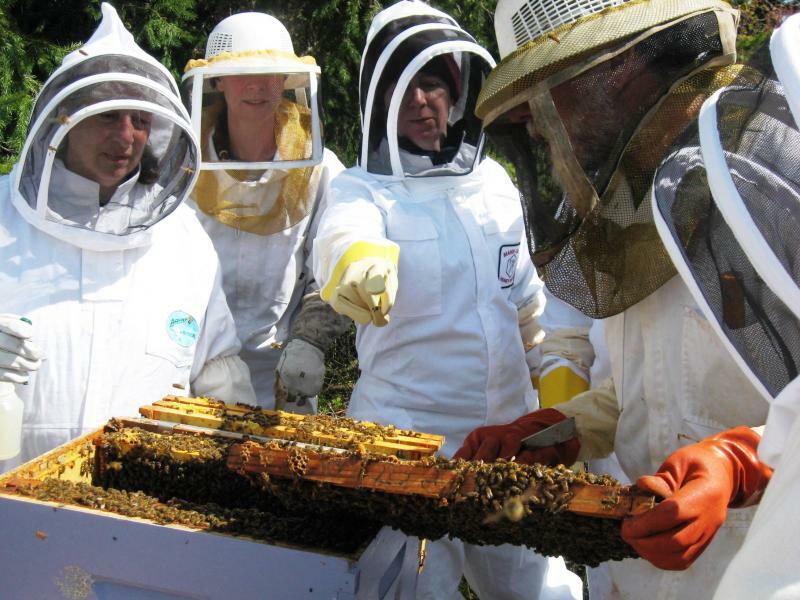 Dr. Dewey Caron has updated his classic textbook, Honey Bee Biology and Beekeeping. Dr. Dewey Caron, a regularly featured LCBA speaker, has co-authored this new edition with Larry Connor; publisher, Wicwas Press. It features impressive color pictures. To purchase, contact Dewey at carond@hort.oregonstate.edu or phone 302 353-9914 and include a mailing address: cost is $55 (FYI, he can’t take credit cards, just check or cash.) Also available at bee suppliers: click on link above. Got Yellow Jackets? Click here for "Protecting Honeybees from Yellow Jackets," a WSU fact sheet. To learn more about yellowjackets, hornets, & wasps, click on our Newsletter link & check out the February 2014 newsletter for a summary of Dr. Carl Roush's informative presentation. For photos of our exhibits at the 2013 & 2014 Southwest Washington Fairs, visit our photo gallery. ﻿Take a look, post information, links, photos, or simply “Like” us on Facebook! This is a great opportunity to post questions and get (relatively) quick answers. 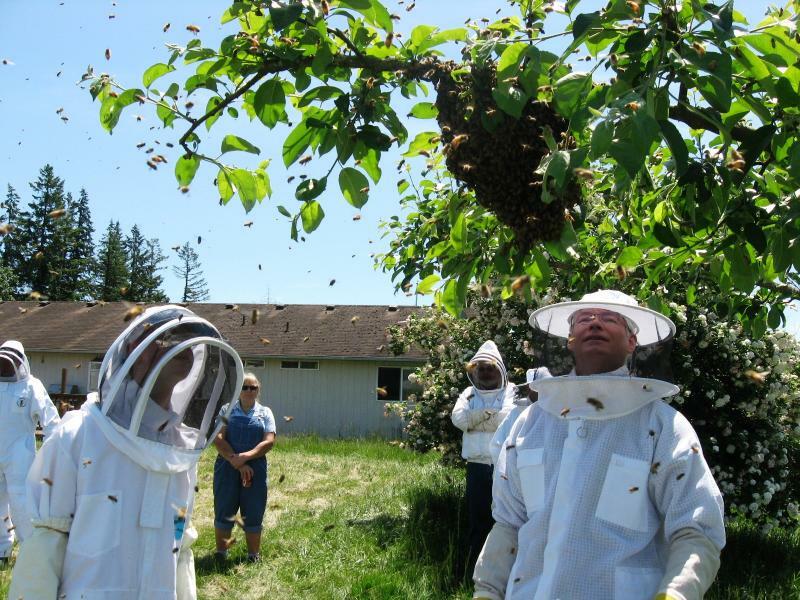 LCBA MEMBER BOB LLOYD'S "APIARY" DISCUSSION PAGE. ON FACEBOOK, ENTER "APIARY" & VISIT! Above, LCBA Beginning Beekeeping class graduate Reena evaluates a brood frame at an LCBA hive inspection workshop. 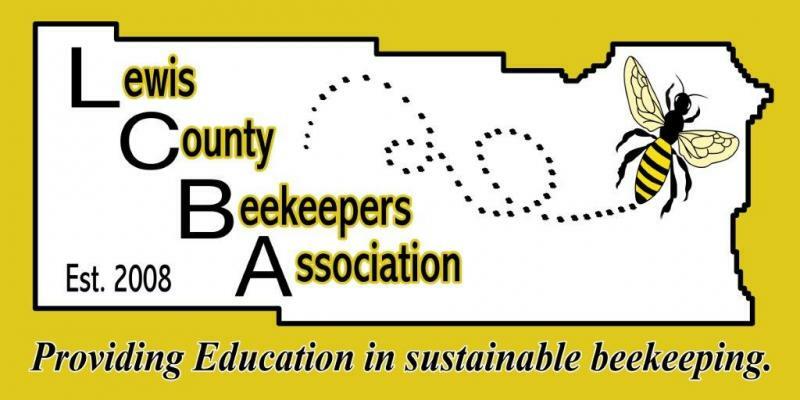 LCBA's Next Beginning Beekeeping Course: January & February, 2019. This class is offered through Centralia College's Continuing Education Program. Registration will begin in December, 2018. For a brochure you can download & print, click here. 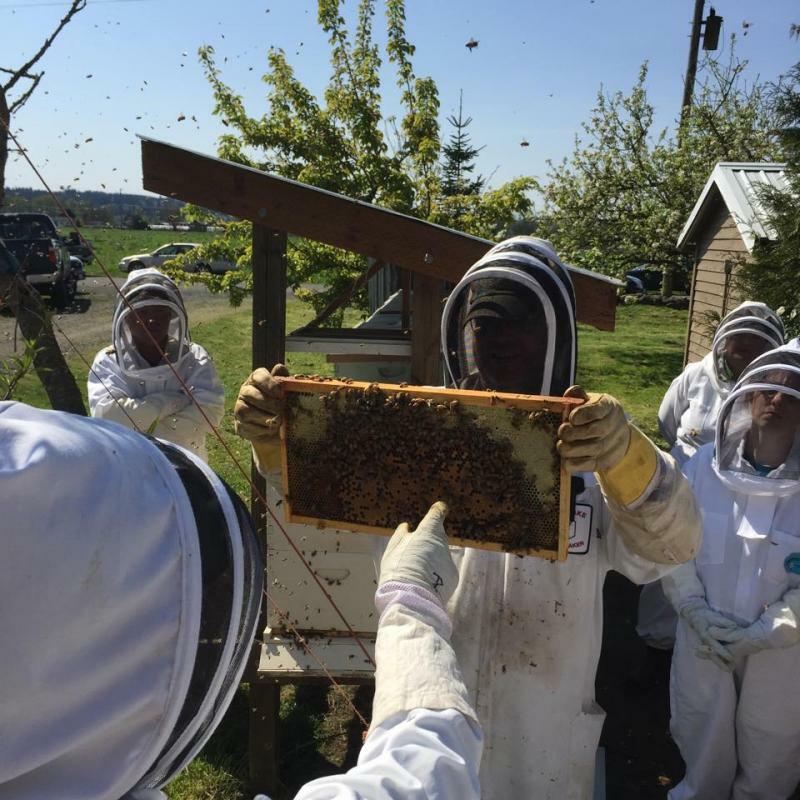 "Your First Year of Beekeeping"
For beginners: learn to keep bees successfully in southwest Washington’s unique conditions. 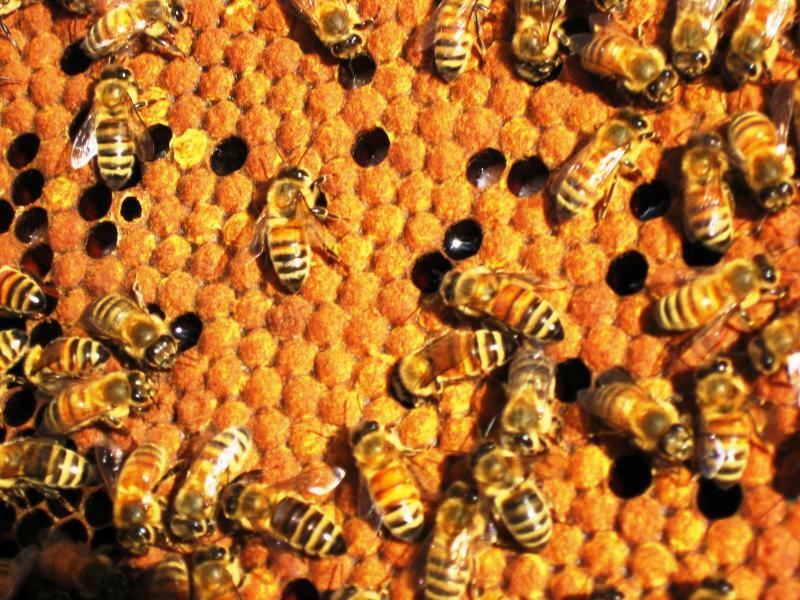 Topics: basic bee biology/behavior, equipment & apiary set-up, seasonal management, identifying & managing parasites & diseases, honey harvesting, over-wintering, & more. Students completing the course earn LCBA’s diploma. 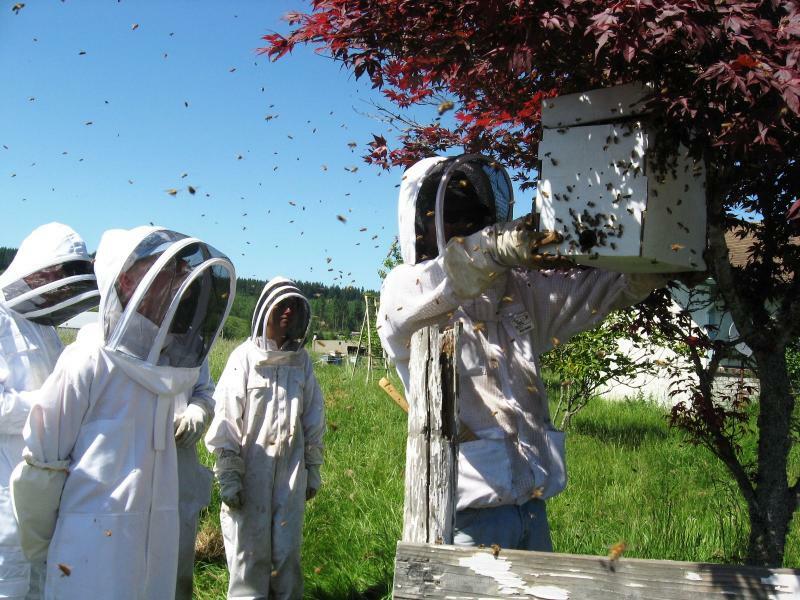 Lewis County Beekeepers’ Association’s manual lays out basics for beginners; LCBA’s PowerPoints & demonstration materials supplement manual with visuals. In-class Q&A welcome; children welcome, too. LCBA board members with many years of beekeeping experience: Education Coordinator Peter Glover, Secretary Susanne Weil, Founder/Vice-President Bob Harris, & guest instructors from the LCBA Board. Questions? Email secretary@lcba.community or call 360 880 8130. Above & below- May 30, our pre-workshop discussion of how to assess colony conditions to prevent swarming was interrupted by, count 'em, 2 swarms ~ so workshop participants got some hands-on swarm-hiving! Above, LCBA President Norm Switzler leading spring management workshop in Randle, April 2014; below, at summer 2014 workshop on removing honey supers, mentor Kent Yates with new member Robin Hahnenkratt prepare to show the "leaf blower" method. We covered fume boards, bee escapes, & the "shake, run, hide" approaches to getting bees off supers without harming them. 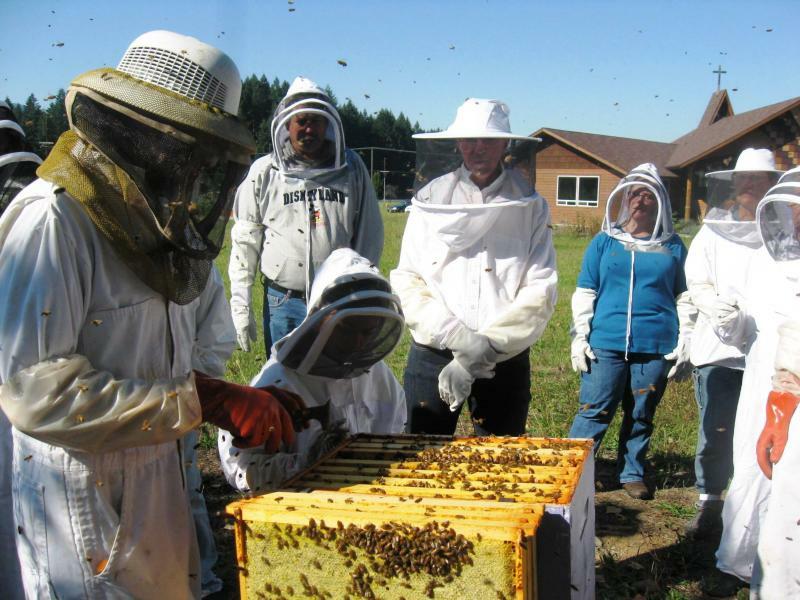 Over 30 turned out for the "great east county hive inspection road trip" to apiaries in Silver Creek, Randle, & Packwood on April 12. Over 50 participated in our two hive assembly workshops on April 5 & February 8 - see our Photo Gallery for pictures. Above, Norm leads fall management inspection workshop in Randle, Sept. 14. This workshop focused on assessing a colony's supplies & readiness to over-winter. Click here to see more on our Photo Gallery.